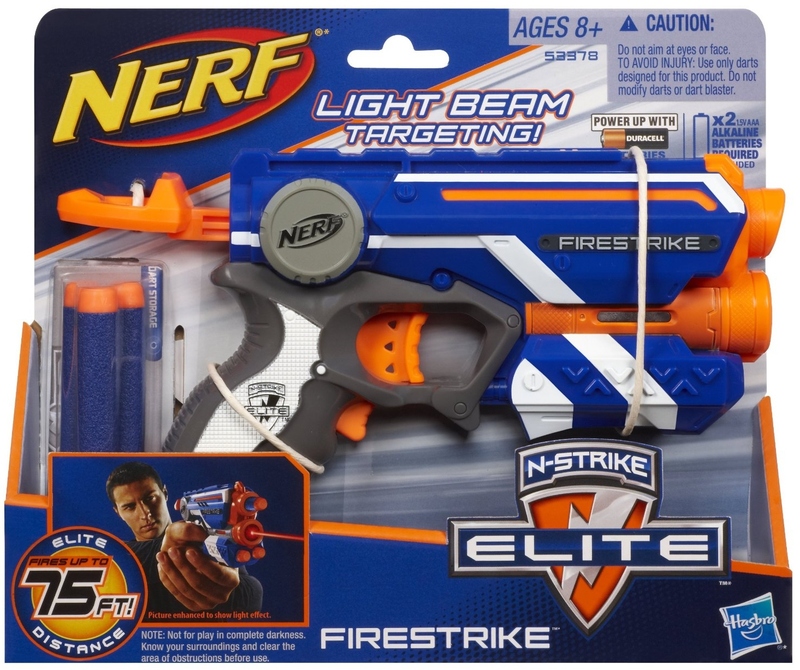 Hey guys, I thought it was about time I started reviewing the new Elite blasters. 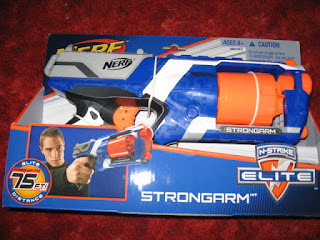 The following is a review by my good friend MerryUnBirthday from BritNerf. 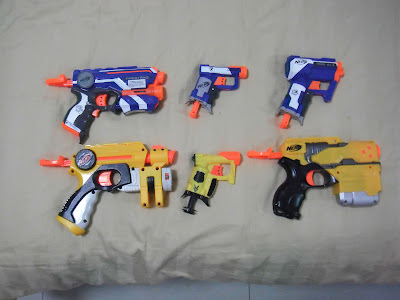 I asked him to review some of the Elite blasters for the blog for two reasons. A, He is hilarious and B, he doesn't mod. Both very important qualities but the latter means that he can review a blaster without the inevitable speculation on how to mod it. 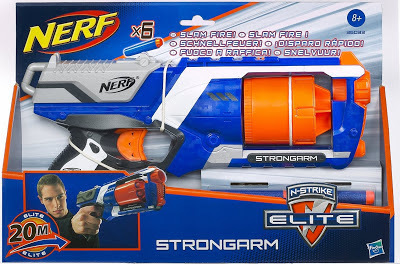 So without any further ado, here is MerryUnBirthday with his review of the Nerf N-Strike Elite Strongarm. My weekly shop is usually a dull affair. Carrots, butter, milk... But wait a minute, what's that? 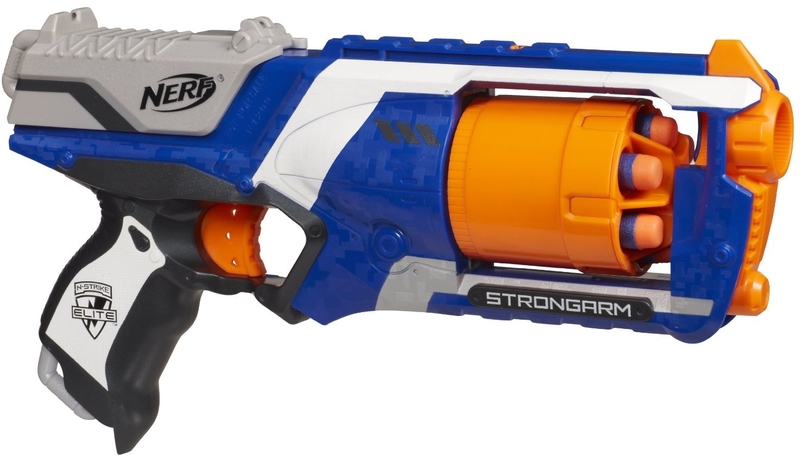 Nerf announces Strongarm and Firestrike. Who knew? 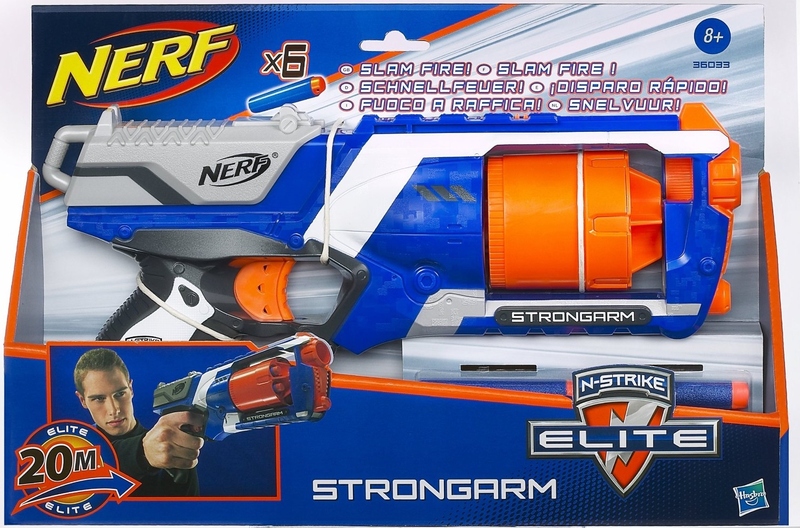 As if from nowhere, it turns out that Nerf are releasing two new Elite blasters next year, the Strongarm and the Firestrike. They also say that there is news on even more new blasters next week. I wonder what they will be. 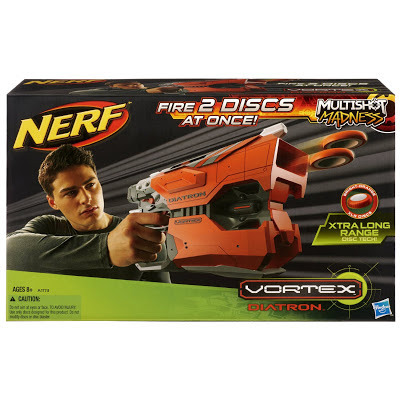 I was looking on Amazon.co.uk and I came across the Vortex Diatron. As far as I'm aware this is the first look at this blaster so enjoy. Remember, you saw it here first! As we already know, the Diatron fires two discs at the same time, and now we know how it does it. Essentially, it appears be two Vigilons stuck together as some sort of 'Manta'd' Vortex blaster. I have to admit, it looks amazing. Thanks to BlackBoarderV for the tip off. It's nice to see these blasters advertised on the net (finally). I feared that they wouldn't be available until later next year but now it appears they'll be an early 2013 release. Thanks to Laurens for letting me know that the Strongarm is also on Amazon. An image on Baidu.com show an “Elite Jolt” being almost identical to the current version. No news as to how it will achieve the elite ranges out of the box. That being said, the current Jolt isn’t far off. Similar to the Jolt IX-1, the Triad has three barrels. It is quite a bit larger than the Jolt and so has a much larger plunger tube. It has three barrels which fire one at a time in sequence, although, you do have to prime it between shots. Very clever. Elite version of the Maverick REV-6. Mysteriously popped up on eBay in July 2012 and quickly generated interest. 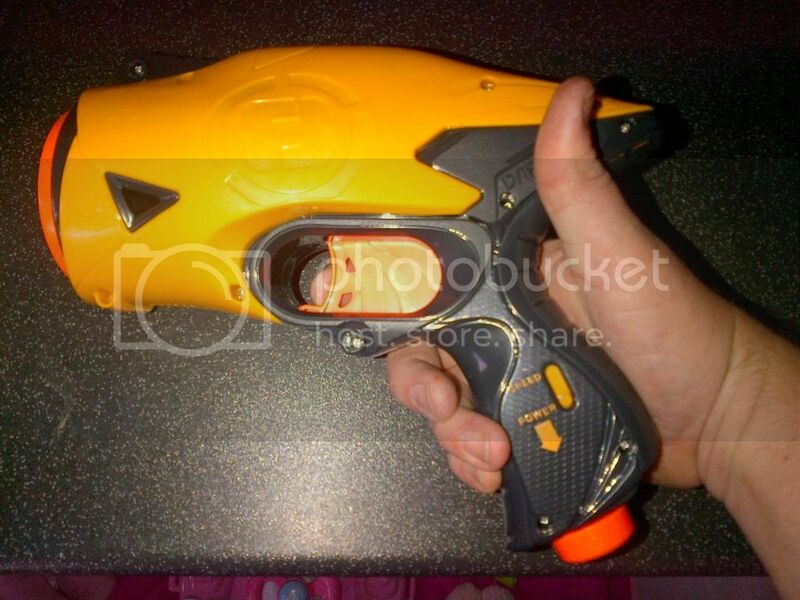 Since it sold (for over £600) there has been no word on this blaster which only fuels the speculation that it was bought by Hasbro to prevent the leak. We can only speculate that the Strongarm has a direct plunger system and hope that they have sorted out the shoddy air seal. 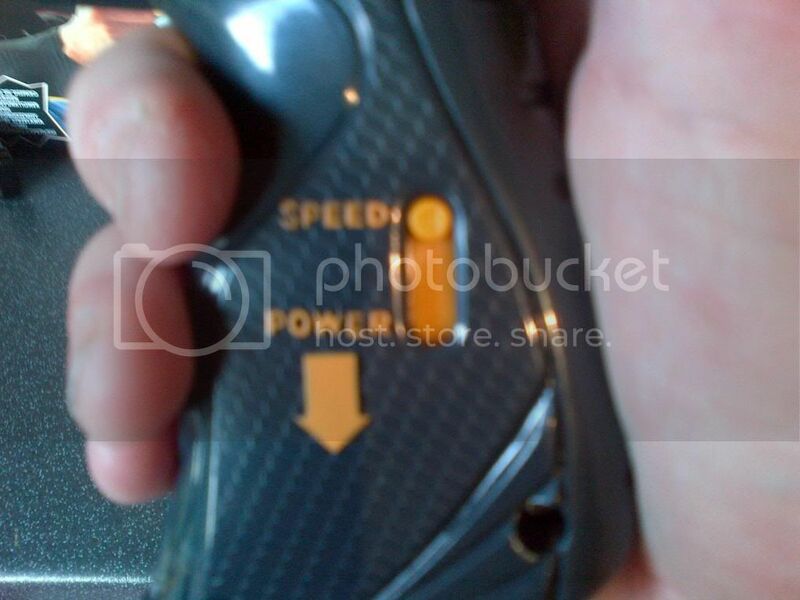 All we have to go in is an image from the back of a pack of Elite Firefly Darts that was leaked in October 2012. Based on the images, we can only speculate that it is a clip fed flywheel blaster similar to the barricade. The Strife was also mentioned in an article by Wired.com in September. No other information is known at this point. So far nothing is known about this blaster so there is no basis for speculation. Again, spotted on the AB Gee website. All we know is the list price of £8.99 leading to speculation that it will be similar to a nitefinder. Elite version of the Nitefinder EX-3. 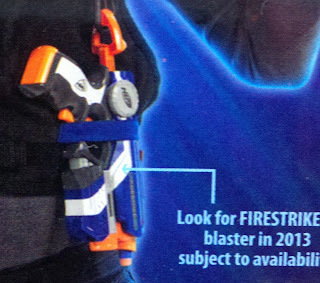 Spotted in July 2012 on the packaging of another elite blaster. 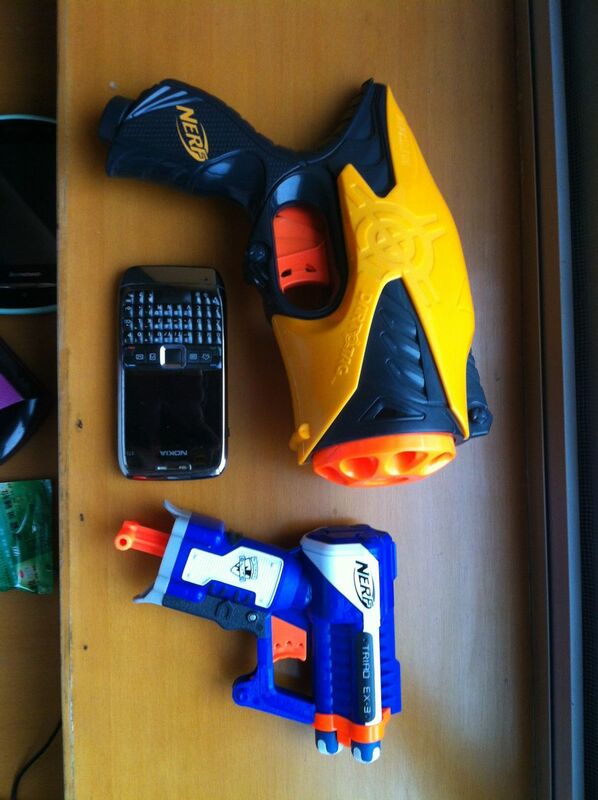 It appears to be a similar size and shape to the Nitefinder but with a couple of differences. 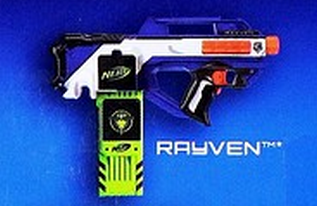 The front part where the dart holders and LED are housed seems to have been redesigned and there appears to be a secondary trigger similar to that of the Rayven and Hailfire. It is speculated that this trigger is for the Firestrike’s LED light beam. 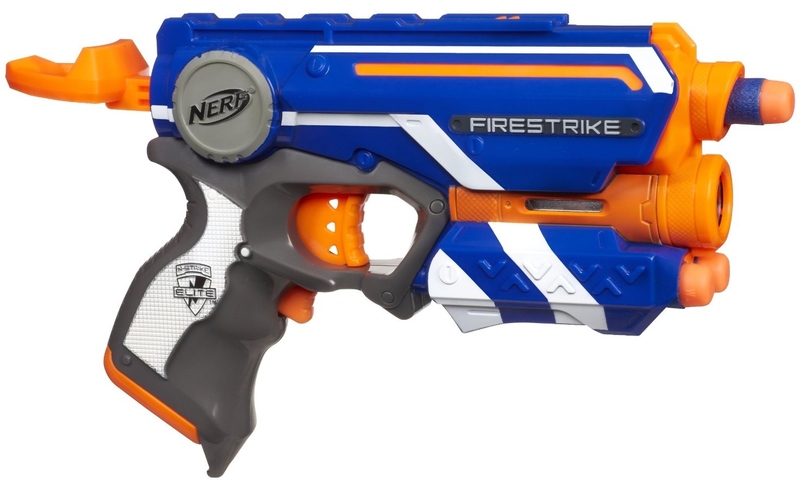 There is no word as yet about the list price of the Firestrike. 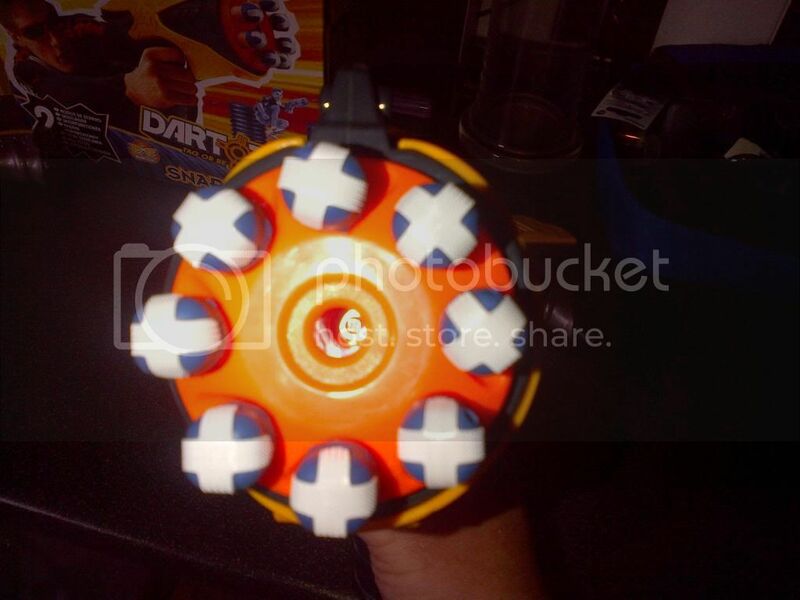 The Ruff Cut was first mentioned in the Wired.com article in September 2012 which stated; “the Ruff Cut... is only the third blaster ever that’s capable of shooting two darts at the same time.” These pictures spotted recently show a very tasty varient of the Barrel Break IX-2. This blaster appears to be pump action and has a total of eight barrels arranged in two rows of four. 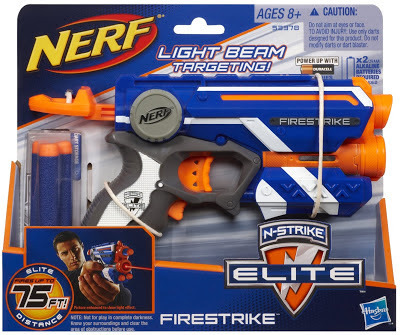 We know from the Wired.com article that the Ruff Cut fires two darts at a time so from that we know that it gives you four shots. All we know is from a picture on the back of a leaked Elite Firefly dart package. Likely to have upgraded internals to help it achieve elite ranges. It’s back and this time it’s blue! 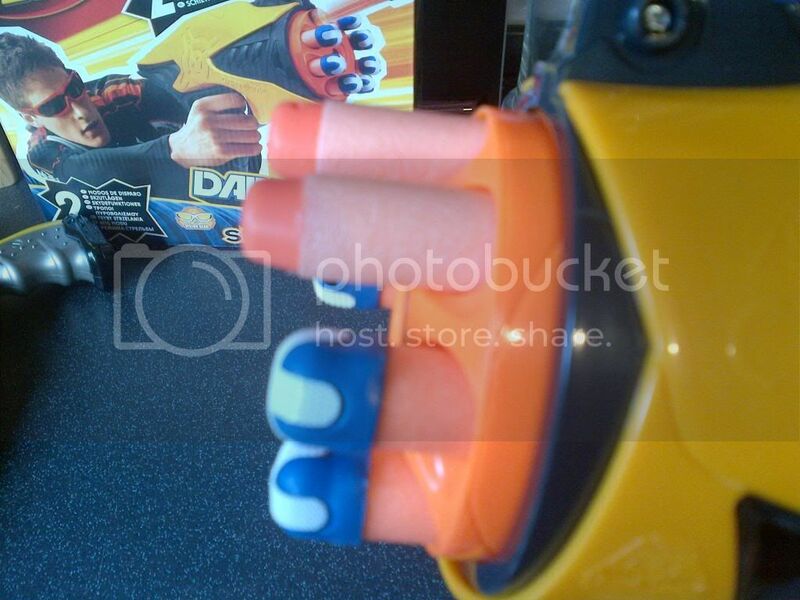 The most sought after Nerf accessory ever will be making a return in 2013. 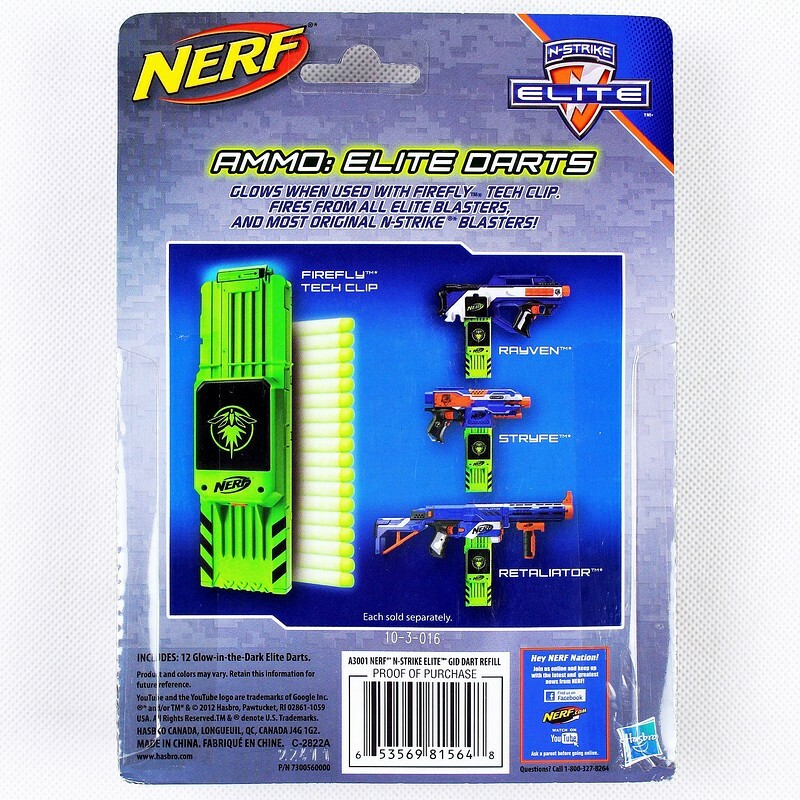 Spotted in a Nerf brochure at a Malaysian Dart Tag Tournament, the Elite Pinpoint Site is going to sell like hot cakes when it hits the shelves. From the information leaked so far, it is exactly the same as the original, just blue. 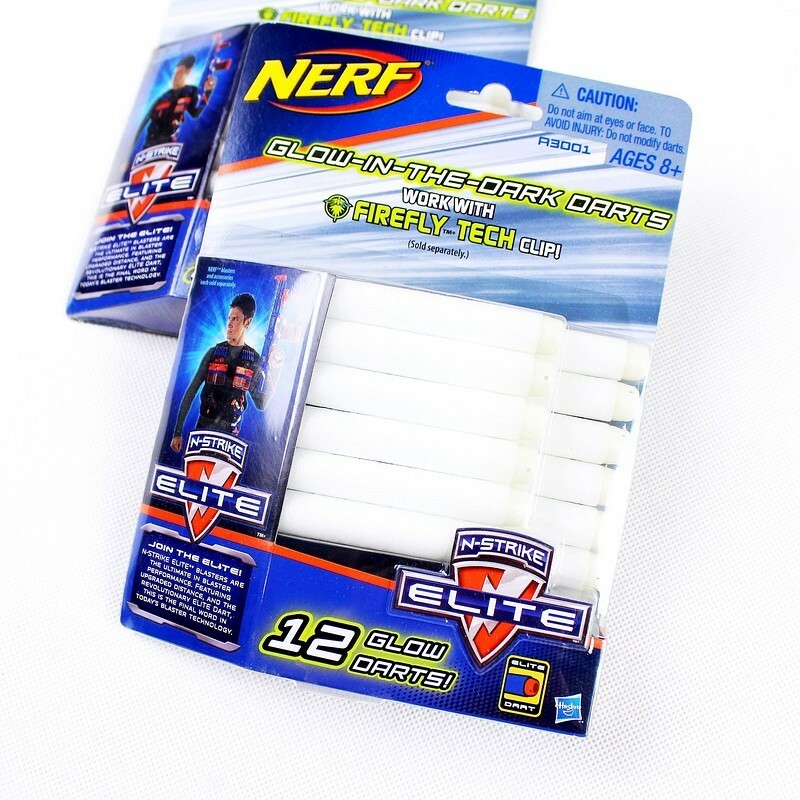 With the success and performance of the Elite Darts, it was only a matter of time before the Firefly Tech glow-in-the-dark darts got the same treatment. 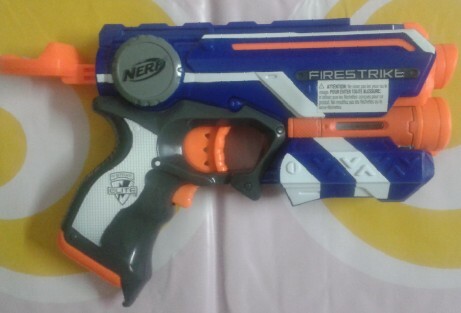 Images of the Firefly darts popped up on TaoBao in October and also gave us images of some other new Elite blasters. It looks like the Firefly Tech clip has had a bit of a face lift also, sporting a bright fluorescent green paint job. Other than that, the clip appears to e the same. Another previously unknown blaster, news the Vortex Diatron also popped up on the AB Gee website. The listing on the website includes the term “multishot” which has led to a lot of speculation as to the blasters format but we have nothing more than the name as basis for this. Hailfire, Elite Jolt, Firestrike, Triad and new look Firefly Tech clip. Elite Firestrike with Elite Red Dot Sight... Phwoar! Urban Taggers have done it again. Pocket. Esq. has gotten the drop on me again by discovering these amazing photos first. Hats off to you sir! 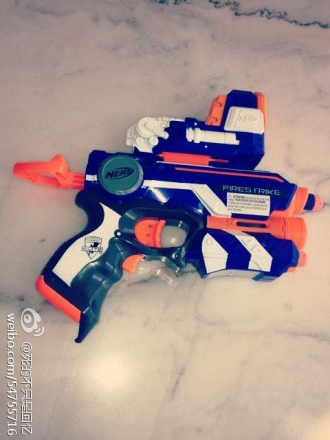 These images from Baidu clearly show the internals of the upcoming Nerf N-Strike Elite Triad. Or is that Rough Cut? 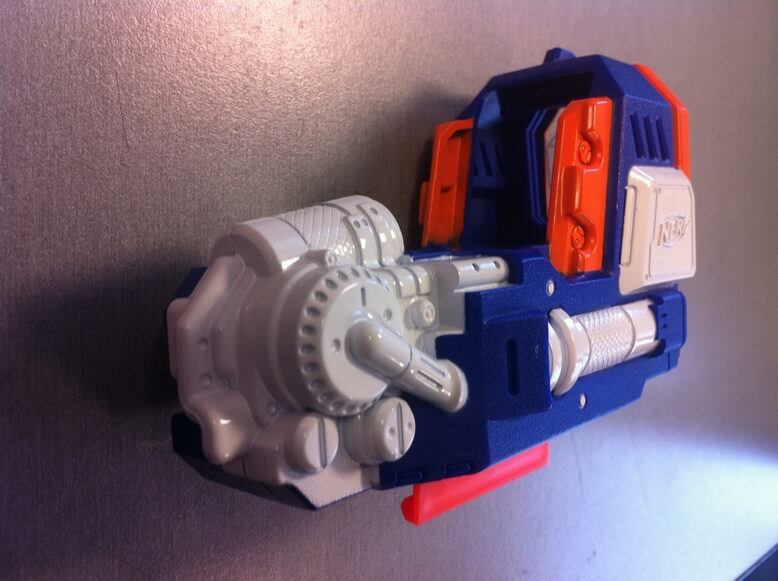 Thanks to a keen eyed follower over at Urban Taggers, we now have our first look at this new blaster due to be released by Hasbro in 2013. A wonderful new friend of mine by the name of Nerfologist has sent me some fantastic information on the 2013 Nerf Elite blasters that we have all been reading about recently. This new picture from Baidu shows some of the new, but currently unreleased N-Strike Elite blasters alongside some older N-Strike models. 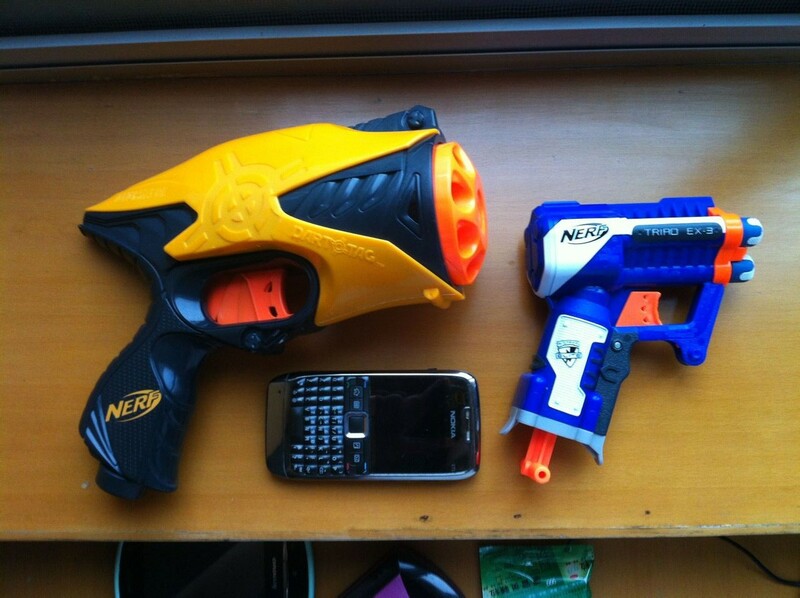 Although this image shows us nothing new, I does give us an idea of the size of these new blasters. We have the Elite Firestrike, Elite Jolt (I'm still dubious of this) and Elite Triad EX-3. Beneath them we have the Nitefinder EX-3, One of the new CLUE (basically Cluedo) Elimination Jolt variants and an Element EX-6. 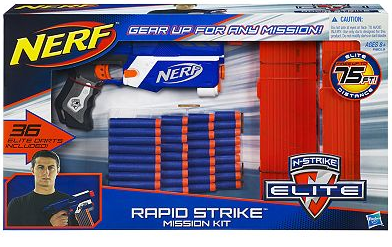 This new Mision Kit features a bare Retaliator, two elite 18 dart magazines and 36 elite darts. A cost effective way to get a retaliator giving you much more for your money than the standard package. As always, no way of knowing whether this will hit the UK shelves. Historically we haven't received any mission kits over here so it's unlikely we'll ever see this but here's to hoping! "The UK Package of Awesome." Last week I sent a special gift to a special guy. Some of you may have seen some of Bobololo's YouTube videos, If you haven't, you should. I contacted Bobo a couple of weeks ago asking if he wanted an Elite Stockade to review (since they aren't yet availiable in the USA). Naturally he jumped at the chance and so, the story began. Whilst out shopping for the Stockade, I noticed that they also had some Snapfire 8s in stock. Being the generous chap that I am, I decided to throw some of them in aswell. Knowing that Bobo really likes to make a good show out of the packages he receives, I decided to throw in a few items that I had to help him get in the British spirit. After adding a couple of my own items, the package was finally ready for shipping. Check out Bobo's unpacking video below. Don't forget to subscribe to his channel. I'm pleased to announce that my new website is up and running and it is AWESOME! I thought it was finally time to showcase all of my work in one place. Over the next couple of weeks I will be updating the site with photos of all of my work to date so keep a look out for some new images. You'll also notice that the website is pulling in content from this blog under the 'Latest News' section. It really is the only place to go for Nerf news in the UK. Go there now and add it to your favourites. Special thanks to my good friend Andi B for designing and building the website. 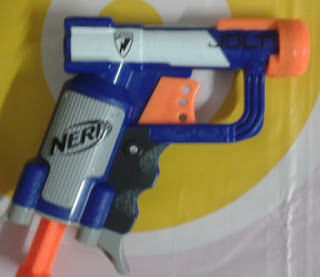 An image on Baidu.com show an “Elite Jolt” being almost identical to the current version. No news as to how it will achieve the elite ranges out of the box. That being said, the current Jolt isn’t far off. As of yet it is unconfirmed as to whether these images are even real. Similar to the Jolt IX-1. 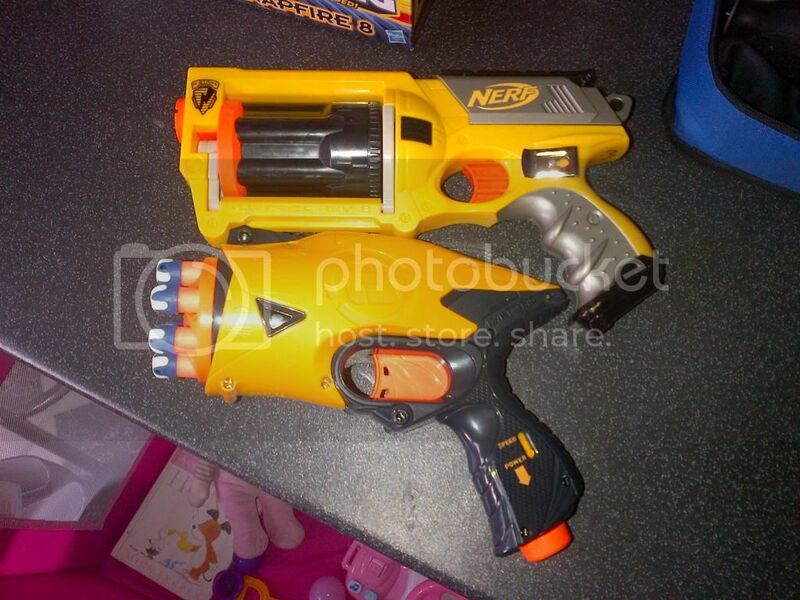 Information leaked so far shows the blaster having three barrels. So far it is unclear whether this blaster fires from all three barrels simultaneously or if the additional barrels are just dart holders. The leak was via a YouKu video early September 2012. A further leak via UK toy distributor AB Gee lists the price as £3.99 although it is unclear if this is even the same blaster. The Ruff Cut was first mentioned in the Wired.com article in September 2012. All we know is “the Ruff Cut... is only the third blaster ever that’s capable of shooting two darts at the same time.” Could this be an Elite version of the Barrel Break IX-2? Who can say? This is all we know. 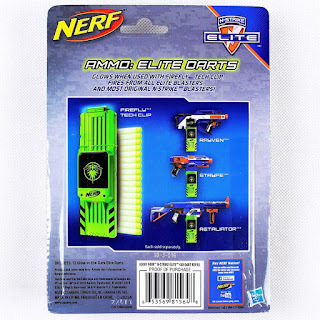 With the recent UK release of the Nerf Dart Tag Snapfire at The Entertainer, I thought it prudent to post a review. 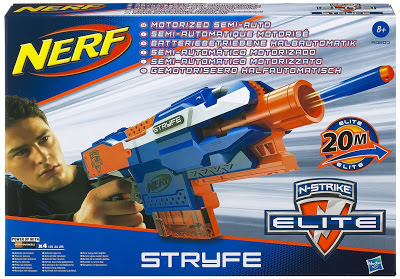 The following review was written by Nerfshack on the Britnerf forum. 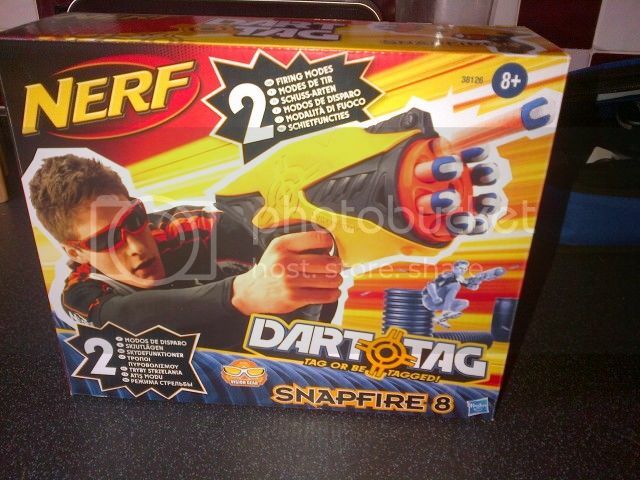 "Well today I took delivery of my new Snapshot 8 dart tag blaster, so I thought I would write a review of it. First off is the box and outer packaging. As with most blasters from the Nerf range box is colourful and bright. Itss quite a small box almost like a fully enclosed maverick. 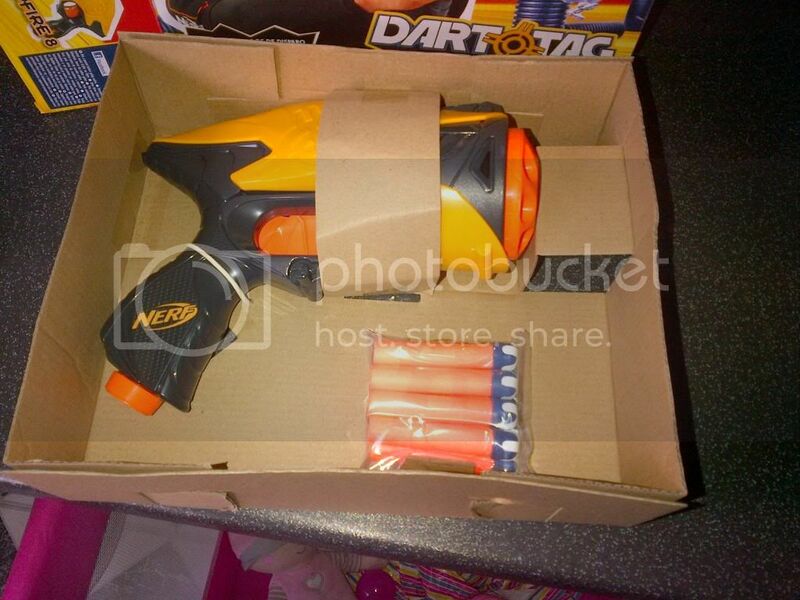 Internally the blaster is packaged well with instructions and 8 dart tag darts. 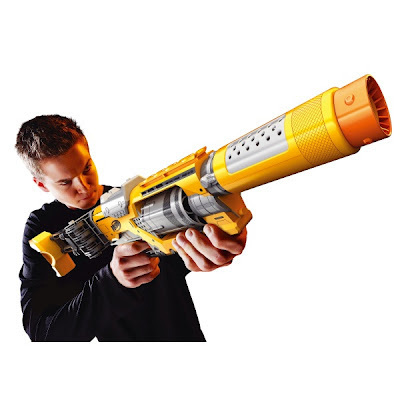 The blaster is easy to get at and not fiddly like many of the larger blasters, with only one tie wrap and cardboard loop holding the handle and body. The blaster fits well in the hand and is quite well balanced. I would put the weight very, very close to a maverick. It is also a very sturdy, well built blaster. The next image represents size compared to maverick. The good thing about this Nerf blaster is that it is semi auto. 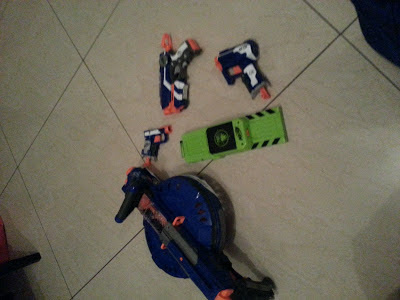 Every time you pull the trigger it primes the blaster, fires the dart and rotates the turret all at once. 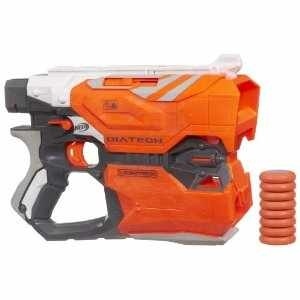 With this blaster holding eight darts and being front loading, In my opinion it out does the maverick for practical applications. It doesn’t stop there. Another great thing about this blaster is the ability to change the power output from speed, (faster firing of the darts) to power (although harder to pull the trigger it does greatly increase the darts range). This is all done via the control knob on the bottom of the grip. I would estimate the range of the blaster on full power to be about 55ft very slightly angled and on speed about 40ft. I tried using streamline darts but they were not very good at all. I am putting this down to the longer post used to hold the tip in place as the darts won’t push back far enough to create a decent seal. Overall I think this is a very good blaster and brilliant for the £8.99 I purchased it for from The Entertainer. With a little modification I think this will be an awesome blaster. I’m thinking AR removal, dart post removal, spring upgrade and PETG barrels. Ever since the Spectre was released at the end of last year, it has proven to be somewhat elusive from shelves in the UK. It was only ever available from ASDA but shortly after Christmas stocks were depleted. After a bit of investigation it turned out that Hasbro never officially released the Spectre in the UK. It seemed that ASDA had secured stock outside of the UK for sale in it's stores. It was obviously a line that they stocked just for Christmas, why else would it have disappeared from the shelves in January? Since then, the Spectre has been something of a rarity fetching prices of upwards of £35 on eBay. As much as I like them and as desperately As I wanted one, I wasn't going to pay that, not for a £13.99 blaster that is still in production. Imagine my surprise, joy and excitement when I discovered that they were in the shops again for this Christmas season. Smyths Toys are the guys who will be taking our money for the Spectre this year. At £24.99, Smyths are selling them for nearly double what ASDA did, but still none to shabby a price for such an awesome blaster. 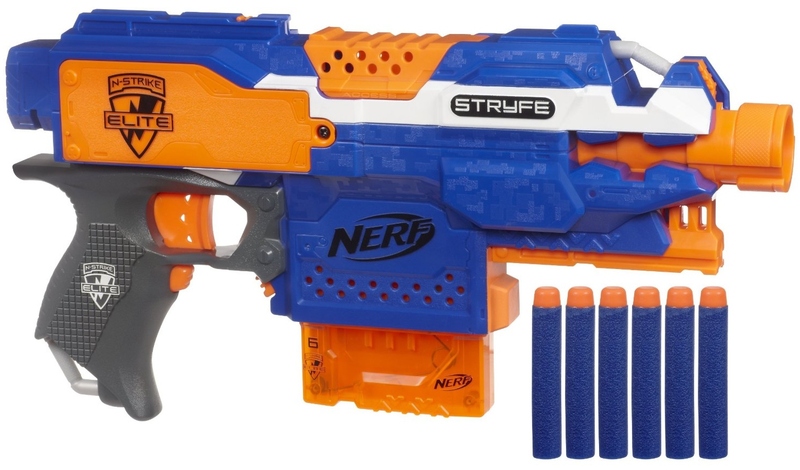 Details on the Nerf Spectre REV-5 can be found here from a previous post. If you missed it the first time, grab one soon as there is no guarantee that the Spectre is here to stay. Whilst checking for offers recently, I stumbled across this little gem at the Entertainer. It's the new Nerf Dart Tag Snapfire. This little guy is awesome. 8 shots, semi automatic and amazingly, no separate priming handle. This blaster has an ingenious mechanism whereby the blaster is primed and fired in one motion of the trigger pull. This makes the Snapfire perfect for dual wielding. On the bottom of the handle is a little dial which can be used to adjust the spring tension, switching from maximum range (but with a hard trigger pull, thus low rate of fire) to high ROF (but with reduced range). When this chap hits the shelves, I'm definately going to hit the shops. Here is a clip of it in action. Thanks to SGNerf for the video. This blaster was recently created for a Mod Exchange Project that I recently completed for my friend, ThatBritishGuy. Inspired by what could be my favourite Marvel character, The Punisher. For those of us who covert rare vintage Nerf blasters, yesterday was a busy day. The first to go was a very desirable Limited Edition, Small Soldiers Nerf SupermaXX 5000. These don't even come up in the US very often so imagine my surprise when this showed up on eBay UK. I'm glad to say that this baby is now mine and takes pride of place in my collection. It's a lot of money to pay, but you get a lot of blaster for your money. I may have to thin out my arsenal for this puppy. The second item, and by far the rarer blaster was the 1994 Mattel Maximizer. 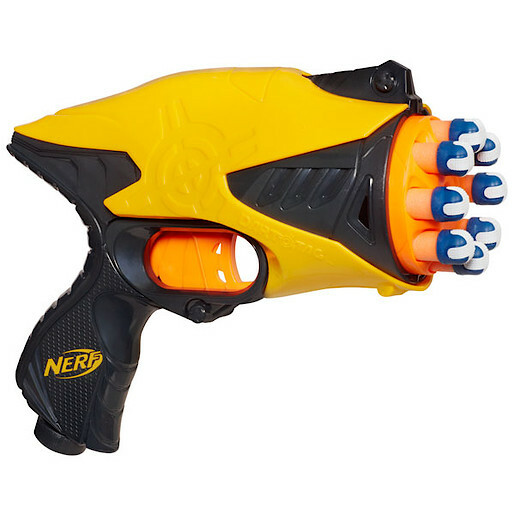 These things are the holy grail of the Nerf world. They are as rare as rocking horse poo and are insanely powerful. Everybody who is anybody in the world of Nerf was bidding on this puppy including myself. Alas, I didn't win and Bobololo was a mere $5 from winning. Whoever did win is surely a very happy chap right now. I was cleaning out the shed today in order to make room for more stuff, lawnmowers and such, the kind of stuff that you'd find in a normal man's shed. Since I would need to move all of my blasters to put some shelves up, I thought I'd take the opportunity to have a bit of a stock take. Laying everything out on the lawn it occured to me that I had two problems; Nerfing had become somewhat of an addiction for me and soon, I would need to buy a bigger shed. This excludes a couple of blasters that I am currently working on but this is the bulk of it. Now I've just got to find somewhere to put my rake. The sharp eyes of Urban Taggers have come up trumps again with this latest blaster leaked on the Chinese video website 'Youku'. What's more, it appears to be the "Elite Jolt" that was spotted on the box of the other Elite blasters. 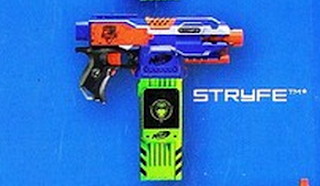 It's called the N-Strike Elite Triad EX-3 and it looks to be a beefed up Jolt with two extra barrels. At first I was excited to think this was a sort of scatter gun but watching the video, it becomes aparent that the two extra barrels are just dart holders which makes more sense really. It also looks like the Elite line is set to bring us some new Elite Whistler darts aswell. I'm still not sure this is a good thing but time will tell. An article published on Wired.com gives us a glimpse into the goings on at Hasbro. The article follows the N-Strike Elite Hailfire from conception to testing and explains some of the processes inbetween. It is definitely worth a read, not only is it very interesting but it also gives us a clue as to what the N-Strike Elite range will bring us next year. "Several models to be introduced next fall are nearly finished-namely the Strife, a semiautomatic pistol, and the Ruff Cut, which is only the third blaster ever that’s capable of shooting two darts at the same time."